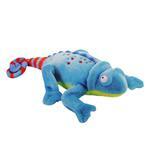 Your dog has been searching the yard for a fun goDog® Amphibianz Chameleon Dog Toy! 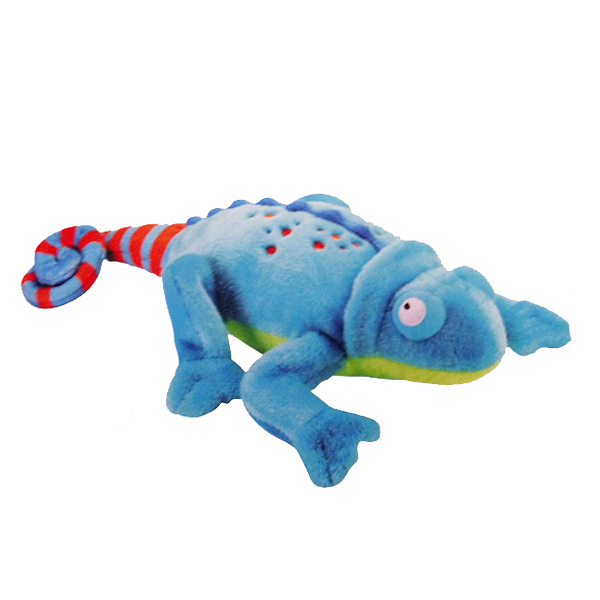 Made with embroidered plush in bright blue and Chew Guard Technology™ this goDog Amphibianz Chameleon is sure to stand up to tough play! 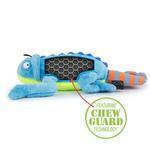 Chew Guard Technology™ is a manufacturing process that adds a tough, durable liner to every toy. The reinforced seams and specially engineered lining were made to withstand the rigors of a dog's play. Dogs are tough but Chew Guard™ is tougher! Even though no dog toy is indestructible, our goDog toys are tougher and last longer than standard soft plush toys…goDog GUARANTEES IT! If this goDog toy does not outlast your standard plush, please visit www.godogfun.com/replacement and fill out the form to get your one-time replacement. Limit of one-time, one replacement per household. BaxterBoo.com does not replace goDog toys. 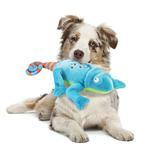 Your dog will love this goDog Amphibianz Chameleon Dog Toy! He's perfect for medium to large-sized dogs for cuddling, tossing, and mouthing. 18" x 10.5" x 6"
Posted On 05/29/18 by Kim D from Perry, ME Yes, Kim D recommends this product! Posted On 07/20/17 by Samantha from Rutland , VT Yes, Samantha recommends this product! My jack russell, Bandit, loves his chameleon toy! Its the only one I've found that he didn't destroy within the first 5 minutes of having it and it still squeaks! (squeakers are the first thing he kills in new toys) I bought him other godog toys but I've had to sew them back together so he could continue to play but this one is definitely worth the money for my destructive little guy. I will be buying more just in case. I ordered a bunch of items for my new puppy and I was so happy with the availability of the products and how easy it was to purchase the right size. I also liked the item descriptions listed; They were very helpful. I will definitely order more products from this company in the VERY near future.